1. 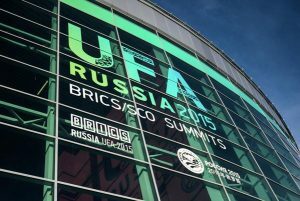 We, the leaders of the Federative Republic of Brazil, the Russian Federation, the Republic of India, the People’s Republic of China and the Republic of South Africa, met on 9 July 2015, in Ufa, Russia, at the Seventh BRICS Summit, which was held under the theme “BRICS Partnership – a Powerful Factor of Global Development”. We discussed issues of common interest in respect of the international agenda as well as key priorities in respect of further strengthening and broadening our intra-BRICS cooperation. We emphasized the importance to strengthen BRICS solidarity and cooperation, and decided to further enhance our strategic partnership on the basis of principles of openness, solidarity, equality and mutual understanding, inclusiveness and mutually beneficial cooperation. We agreed to step up coordinated efforts in responding to emerging challenges, ensuring peace and security, promoting development in a sustainable way, addressing poverty eradication, inequality and unemployment for the benefit of our peoples and the international community. We confirmed our intention to further enhance the collective role of our countries in international affairs. 4. At our meeting we emphasized that the year 2015 marks the 70th Anniversary of the Founding of the United Nations. We reaffirmed our strong commitment to the United Nations as a universal multilateral organization entrusted with the mandate of helping the international community maintain international peace and security, advance global development and promote and protect human rights. The UN enjoys universal membership and has a central role in global affairs and multilateralism. We affirmed the need for comprehensive, transparent and efficient multilateral approaches to addressing global challenges, and in this regard underscored the central role of the United Nations in the ongoing efforts to find common solutions to such challenges. We expressed our intention to contribute to safeguarding a fair and equitable international order based on the purposes and principles of the UN Charter and to fully avail ourselves of the potential of the Organization as a forum for an open and honest debate as well as coordination of global politics in order to prevent war and conflicts and promote progress and development of humankind. We recall the 2005 World Summit Outcome Document and reaffirm the need for a comprehensive reform of the United Nations, including its Security Council with a view to making it more representative and efficient so that it could better respond to global challenges.